Another success of Integris! KIOSK software has been recognized as “Product of the Year 2018”! 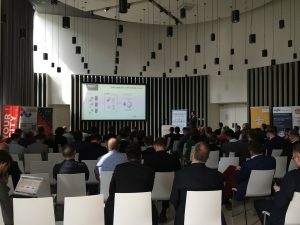 The next edition of the conference and exhibition Industry 4.0 took place on 9th April 2019 in Warsaw, at the Sound Garden Airport Hotel. The conference was attended by specialists from the broadly understood industry and technology. 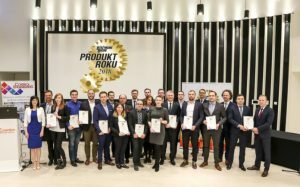 At the end of the evening was held the “Product of the Year 2018” award ceremony in competitions organized by the editorial offices of “Control Engineering Polska” and “Inżynieria & Utrzymanie Ruchu”. This event was a great opportunity to meet respected experts in the fields of research, development and science, as well as experienced engineers. During lectures the speakers presented their latest solutions, research results and their impact on users and managers. The conference was attended by over 200 participants and 18 presentations regarding Industry 4.0 were presented. During the event it was also possibility to look at the exhibition, where reputable suppliers of technology could show theirs products related to modern production. 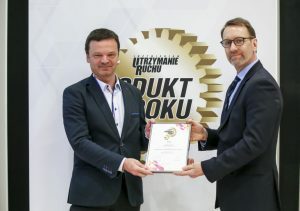 After the conference was held the “Product of the Year 2018” award ceremony in competitions organized by the editorial offices of “Control Engineering Polska” and “Inżynieria & Utrzymanie Ruchu”. The participants of the event had the opportunity to see which of the submitted products have gained the recognition of the jury and readers of both magazines. potential economic and non-economic benefits associated with the use of the product. We have also submitted our product – „Kiosk” to participate in the competition. This is a solution which simplifies the process of handling loads in the company. It consists of a software dedicated to touch panels, which allows driver to enter data identifying and functionality in Microsoft Dynamics AX 2012 R3 allowing for automation of processes. We are pleased to announce that “Kiosk” became “Product of the Year 2018” in the category: Software for the maintenance and production department. This is a great distinction for us and we are glad that our product has been appreciated by the jury and readers. We would like to thank you for all the votes cast. Mr. Arkadiusz Zimniak – President / Board Member, Integris Systemy IT Sp. z o.o. Member of the Integris IT Systems Management Board in the DynamicsPact authorities! 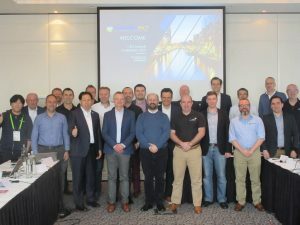 On 27-29 March 2019 in Amsterdam has been held an annual meeting of DynamicsPact members – the largest alliance of companies implementing Microsoft Dynamics ERP systems. The conference was an opportunity to discuss plans and internal issues related to DynamicsPact. Furthermore also the current situation of DynamicsPact was presented and possible actions have been assessed. Participation in the meeting provided everyone with valuable knowledge and motivation to undertake further system challenges. We are pleased to announce that during this event, one of our management board members – Paweł Gabryelczyk was elected to the new DynamicsPact Management Committee! This is a huge success, because only four people from all over the world can be included to this group. Additionally, Paweł Gabryelczyk is the first representative of Central and Eastern Europe in the DynamicsPact authorities. New client and new system implementation “in the cloud”. We are happy to announce that we have started a new system implementation of Microsoft Dynamics 365 for Finance and Operations. Our, also new client is a modern Polish production company with a trading branch in Germany. The main goal of the implementation is to maximize automation of processes, in particular in the area of ​​planning and scheduling of production and inter-company processes. The implementation is to be focused on the fastest possible route to start-up the System and achieving the assumed added value, therefore the SaaS “in the cloud” deployment model and the agile implementation methodology were chosen. We invite everyone to watch our videos on YouTube. If you are looking for tips on how to use the Microsoft Dynamics 365 ERP system, you’re in the right place! In a series of videos presented by our skilled consultants we will show you how to quickly configure the functions available in the system and adapt it to work with other programs. We also encourage you to subscribe to our YT channel. Enjoy! We are pleased to inform that the Faculty of Management Engineering at Poznan University of Technology, in which we implemented Microsoft Dynamics teaching lab took 4th place in the ranking of the best economic faculties of Polish universities. Every year the “Rzeczpospolita” newspaper publishes the ranking of leading universities in Poland. The high-ranking place of the Poznan University of Technology was decided by very high mark for the quality of teaching. Every year, several hundred students equipped by Integris have the opportunity to learn about one of the most modern ERP systems in the world, Microsoft Dynamics 365 for Finance and Operations and Dynamics AX. Integris has been providing IT solutions for over 20 years and the experience we have gained over the years of cooperation with universities and higher education institutions has enabled us to define their most frequent needs. If your company has Microsoft Dynamics AX or D365FO and you are struggling with problems and want to take advantage of the latest achievements of technology, you are welcome to contact us! The 5th national Manufacturing Summit conference – was held on November 14, 2018 in Wrocław, where over 100 delegates, including Integris and representatives of companies from the manufacturing industry interested in the development of digital strategies gathered. The meeting attracted authorities from business and industry circles who willingly shared their expertise and knowledge and discussed an important problem related to the digital transformation of production. Why does Industry 4.0 becomes so popular and what can companies gain thanks to ubiquitous digitalization? Are companies ready for a digital revolution? Do the tools available on the market meet the needs of producers? Improving the organizational culture and the increasingly difficult situation on the job market. The programme included lectures and presentations of the latest technologies and solutions that can improve efficiency of factories and supply chains and make production even more intelligent. Particularly noteworthy was Microsoft’s remote presentation, which presented the concept of “Factory of the Future”, based on the Microsoft Dynamics 365 solution integrated with the latest technologies such as HoloLens. This example shows us what the future of production will look like from the leading experts. The conference was a unique opportunity to see how the industry evaluates and implements Industry 4.0 and an opportunity to learn about new technologies and applications that can improve productivity within the company, as well as to establish new contacts with suppliers and peers in the industry. We invite all of you to familiarize yourself with our new and refreshed website and to check our products and services offer. Especially for you, our new site has been completely redesigned, now you can easily open it and navigate on any device. We encourage you to follow the website and our social media profiles. All content is regularly updated, thanks to which we provide support for business customers and keep you up to date in the world of tech news. Microsoft announces the end of basic support for the following products from October 9, 2018. After this date only quick-fix security updates will continue to be provided for these three versions in an extended support period that will last until October 12, 2021. For more information, please visit Microsoft’s support page. At Integris we offer support and updates to the latest versions of Microsoft Dynamics AX software. The latest version, which is Microsoft Dynamics 365 for Finance and Operations, combines the functionality of the Dynamics AX system and the cloud functions of the Microsoft Dynamics platform. Our specialists will be happy to help you choose the optimal licensing plan, present a clear system setup structure and follow the best possible and safest upgrade path. We are ready to take advantage of our extensive experience from various ERP system extensions – including minor technical updates and complex, full implementation projects. We encourage you to contact us to discuss the details of software updates or to learn more about our services.